Joseph Hill was born in 1949 in the parish of St. Catherine in Jamaica and became involved in the music business in the early 1970’s when he began to record a few sides at Studio One. One of these songs was “Behold” and was backed by the Soul Defenders band. Hill and the Soul Defenders recorded a body of work which was later released on the Heartbeat label as The Soul Defenders at Studio One (Hearttbeat, 1991). Hill played percussion and provided backing vocals on many Soul Defenders tracks, working with Burning Spear and Dennis Brown among others. The song “Behold”, which Hill recorded during that period, can be found on the Best of Studio One, Vol. 2 – Full Up CD (Heartbeat). In 1976, Hill formed a harmony trio called Culture with his cousin Albert Walker and a friend called Roy Sylvester Dayes, whose nickname was "Kenneth.” After an initial 45 entitled "This Time" for the producer Joe Gibbs, the group recorded an album for the same producer, Two Sevens Clash (Joe Gibbs, 1977), an LP which caused a sensation in Jamaica and in England. The title track sounded like a prophecy about the end of the world and had apocalyptic overtones, with its mystical reference to the number 7. References to Marcus Garvey and the Jamaican “cotton tree” also contributed to the mystery surrounding the lyrics. As indicated by Laura Tanna in her Jamaican Folk Tales and Oral Histories, Marcus Garvey's prophecies are part of the Rastafarian oral tradition (Tanna 54-56) and have been circulating for a long time in Jamaica. In June 1973, Tanna recorded a story related by one of her informers, known simply as Bongo, which is similar to the one told by Hill in "Two Sevens Clash": "He prophesy again dat witin dat said time, Kingston and Spanish Town shall meet" (Tanna 55-56). Barry Chevannes also mentioned the same prophecy (redemption will come when Kingston meets St Catherine) in his study of the Rastafarian movement (Chevannes 106). Another prophecy mentioned in "Two Sevens Clash" and other reggae songs concerns the fact that Marcus Garvey was imprisoned in Spanish Town prison and that when he was released he predicted that no one would ever use the prison's gate again: "De gate dat he came tru, he said dey would never carry anoda man of his category tru dat gate but it shall seal" (Tanna 55-56). In "Two Sevens Clash", Joseph Hill also mentions a cotton tree which was struck by lightning outside Ferry police station. In fact, there was a cotton tree outside the police station in Ferry. It was known as "Tom Cringle's cotton tree" and was struck by lightning on 18 January 1971 (Senior 489), which blocked the nearby road for some time. Hill seems to have transferred this event to the year 1977 to create a dramatic effect. It must also be said that the cotton tree, also known as the silk cotton tree, is an important tree in Jamaican culture as it was beneath a cotton tree that obeahmen would bury the shadow of a living person in order to harm that person. If that shadow was not restored, the person could die. So the cotton tree is associated with witcraft (or obeah), magical powers, but definitely non-Christian beliefs and the fact that it was struck by thunder and ligthtning may suggest God’s disapproval of the way colonial authorities treated Garvey. According to White, the song was actually a biblical prophecy based on the Book of Revelation in which St John the Divine had predicted the Apocalypse. The Book of Revelation contains many references to the number "seven "(the seven lamps of fire, the seven spirits of God, the book with the seven seals, the seven angels) which is associated with magical potency. "Two Sevens Clash" can also be viewed as the continuation of a long tradition of resistance stretching all the way back to the great Jamaican revival of 1861 and which also includes famous "prophets " like Bedward the Flying Preacher who prophesied that he wouyld fly to heaven on December 31st 1920 and come back on January 3rd, 1921, and also Claudius Henry, the Repairer of the Breach, who prophesied that Jamaican people would be repatriated to Africa on October 5th, 1959. The song was also popular in England on its first release and found favour with the punk movement which had been insisting on the idea that there was "no future" for English young people at the time. The Two Sevens Clash album also contained roots anthems like "I'm Not Ashamed", "Natty Dread Taking Over", and "Pirate Days", which lamented the fact that the original inhabitants of Jamaica, the Arawaks (referred to as Tainos today) were wiped out by the English ("The Arawaks was there first!"). "I'm Not Ashamed" encouraged Rastafarians to "shake out their knots", or to display their dreadlocks in public in defiance of Jamaican society, which was not a common thing in 1976. Other tracks included "I'm Alone" and "Jah Jah See Dem a Come", which was actually the song which first made the group popular in Jamaica, and which was released as a 45 before "Two Sevens Clash.” It is based on an old Studio One instrumental entitled "Heavy Rock" (aka "Better Dub") and pits the righteous Rastas against the police. The song was in fact inspired by an incident which happened in Joe Gibbs' studio. In an interview granted to Roger Steffens, Hill recalled how he had seen Gibbs throw a plateful of food into a dustbin as a hungry youth was asking him for food. Hill seemed to suggest that Gibbs had done this to spite or humiliate the youth, which led to the writing of the song. The Two Sevens Clash album also contained a song entitled "Black Star Liner Must Come", which referred to a prophecy according to which Marcus Garvey's ships, the Black Star Liners named after the Black Star Line shipping company he had founded, would file into Kingston Harbour to repatriate black people to Africa. That prophecy had already supplied Fred Locks with a major hit in 1975, entitled "Black Star Liners" ("Seven miles of Black Star Liners coming into the harbour"). 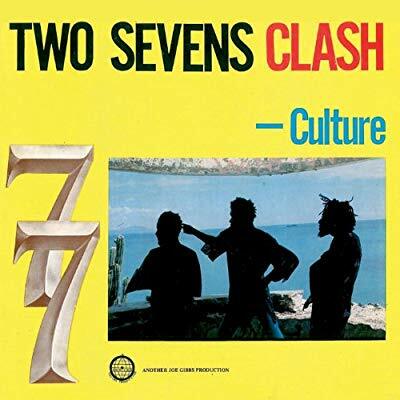 The Two Sevens Clash album has remained very popular and was re-released in 2007 and 2017 to commemorate the 30th and 40th anniversaries of the release of the original LP in 1977. What else do you need to hear to know what a classic it is? Chevannes, Barry. Rastafari - Roots and Ideology. New York : Syracuse University Press, 1994. Katz, David Solid Foundation – An Oral History of Reggae. London: Bloomsbury Publishing, 2003. Senior, Olive. Encyclopaedia of Jamaican Heritage. Kingston: Twin Guinep Publishers, 2003. Steffens, Roger." Joseph Hill: Forward to Zion.” The Beat, Vol.25, October 2006. Tanna, Laura. Jamaican Folk Tales and Oral Histories. Kingston : Institute of Jamaica, 1984. White, Timothy. Catch a Fire – The Life of Bob Marley. New York: Henry Holt, 1983.